Vintage pair of oak ashtrays by Robert "Mouseman" Thompson. Both showing some discolouration to centres otherwise offered in good condition measuring 10cms x 8cms. 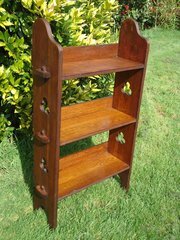 Arts & Crafts oak pegged bookcase with tulip piercings to sides. Offered in excellent condition having been stripped and re finished. Probably a liberty design Height 111cms. Width at pegs 68cms. Depth 22cms. Height of interior shelves: top 22cms, middle 25cms. lower 28cms. An unusual Arts & Crafts lithograph of a Dutch scene of three gentlemen drinking beer by the harbour by the Belgium artist Henri Cassiers (1858-1944) Many such prints were retailed by Liberty. 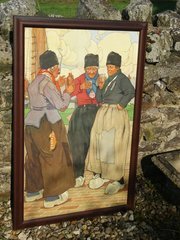 This has been recently framed and is offered in a very good condition. The frame measures 88cms x 57cms and is glazed. 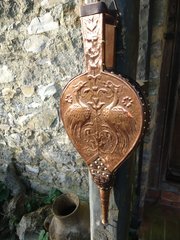 Rare pair of Arts & Crafts copper bellows made by the Keswick school of Industrial Arts and stamps accordingly. Decorated with a pair of birds possibly peacocks to one side. The leather and studs have been replaced. Total length 44cms. Width 16cms. Depth 4cms. They puff well! 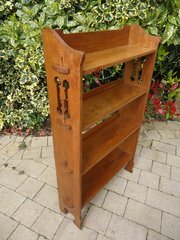 Small Arts & Crafts Sedley pegged oak bookcase for Liberty with trefoil piercing to ends. Offered in good original condition with some marks to top shelf as shown and the shelf height has been adjusted as can be seen from the back. Height 99cms. Width at pegs 56cms. Depth 22cms. Height between top and middle shelf 27cms abd between middle and bottom shelf 27cms. Chunky and excellent quality Arts & Crafts drop leaf table made in quarter sawn oak. Offered in excellent original condition with a height of 72cms and a depth of 56cms. When closed the width is 26cms and when open it extends to 70cms. 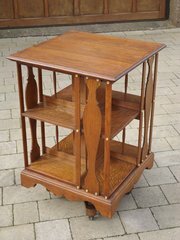 This design was retailed by Liberty & Co.
Lovely Arts & Crafts oak revolving bookcase. Lovely Arts & Crafts revolving bookcase made in quarter sawn oak as possibly made by Shapland & Petter. A delightful design. Revolves smoothly and is offered in excellent condition, having been stripped and refinished. Height 76cms.The top measures 51cms square. Height of top shelf 23cms. Height of bottom shelf 27cms. This is slightly smaller than many other revolving bookcases so would fit in to a smaller room. 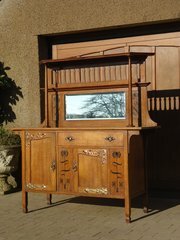 Very stylish Arts & Crafts oak dresser retailed by Maple & Co. This has elaborate copper on brass strap work and an attractive ebony stylised floral overlay. The top has its original bevelled edged mirror with some minor clouding. Above there is a pierced spade gallery. There is an ivorine label to the inside of the door reading Maple & Co, London and Paris. The top is secured with two decorative pillars There is a cellar drawer and shelf (not shown) to the left hand side and drawer to right with cupboard with shelf beneath. Height 165cms. Width 153cms. Depth 56cms. Base height 91cms. 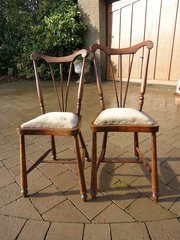 Offered in excellent original condition except for a small chip to back of right leg. There are no keys but doors stay closed without locking. Stunning Pair of Lefco jardinieres. 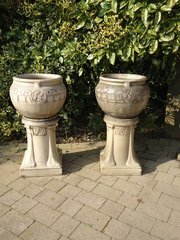 They stand 92cms high with a diameter of 50cms at the bowl. These were made by the Leeds Fireclay company and retailed by Liberty. There is a slight variation in colour and the paler one has a chip to the base. Otherwise offered in good condition showing signs of being used. Pretty Arts & Crafts copper watering can by Joseph Sankey and Sons of Birmingham. 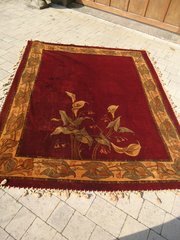 It has three delightful stylised tulips with leaves on each side. Offered in excellent condition. Stamped to base with the number 6 and J.S & S B. Height to top of handle 29cms. Width 14cms. Depth from handle to lip 32cms.